In a fit of usefulness last weekend, I did three things. 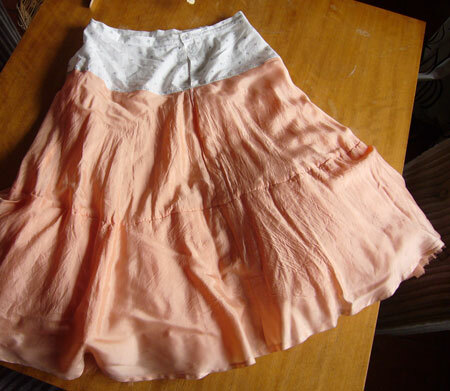 Thing the first: I took an old ratty petticoat I’d bought at a garage sale that was too short and had lost the stretch in its elastic top and fixed it. 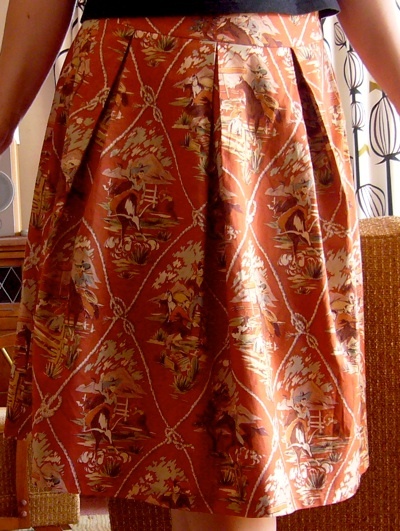 I sawed off the old top with my overlocker. Then I traced off the nicely-fitting waistband of the 80s skirt I shortened a while back and used it to make a new top from a thin cotton. No, it doesn’t match, but it’s very fine so it adds hardly any bulk at all. Yay. Thing the second: Bolstered by my waistband drafting success, I had another bash at New Look 6981 that I’ve made previously with a poorly-fitting waistband. I used a winter-weight denim pinstriped with little rainbow threads and drafted some in-seam pockets. Other than me botching the left pocket due to to too-short zip/overzealous seam allowance trimming incident that we need say no more about, it’s a good ‘un. Here Headless Esme models the skirt and, simultanously, because she can multi-task despite her cerebral disadvantage*, she models Thing the third. From a recent clothes swap, I picked up a silk tunic from a friend who complained it was shapeless and didn’t fit. Thus, sadly, is the nature of tunics, I find. So slashy-slashy, hemmy hemmy, I took it up and made a top. NEXT. Well, next is some sort of warm weather pfaffing about sunfrock. Yup, it’s the middle of winter. But I am off to warmer climes to pfaff about for a couple of weeks. And that deserves a new sunfrock. *she must, however, be excused for not ironing said garments. She has no arms. Be kind. I had a bash at New Look 6981 upon Erin’s evangelism for same. 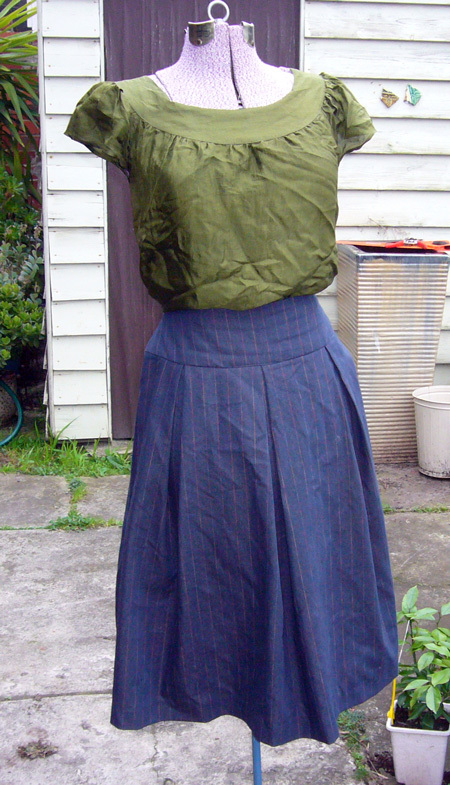 The fabric was some bargain quilting cotton from Darn Cheap covered in – YEEE HA! – cowboys. Seemed to suit the pattern because the big, directional rope-bordered diamonds kinda eliminated tricksy seam options. Came out orright. Should have shaped the waist yoke a bit better and might eventually re-do it. 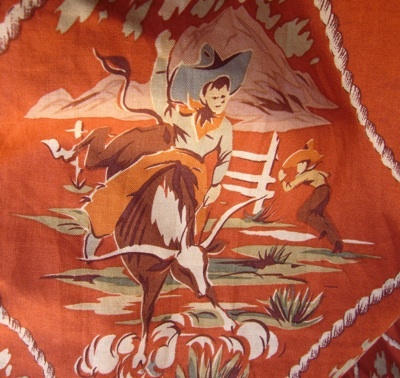 Love the dude in the background who’s running away from this impending rodeo disaster. What else, what else…. despite the stony silence around here, I have been making a thing or two. I made the cowl-necked top that goes with the pattern above which again, was orright, but I should have made a bit longer. (Why haven’t I learnt this yet?!) I made Simplicity 3833 for a friend but forgot to take a pic before sending it on its way. And I’ve been working on the Duchess of Windsor dress in a Japanese silk for a few weeks including hand-picking the narrow hems. Which explains the weeks. I need more stunt dresses, I think. I’m heading in to the Ladies’ Lounge to see what I can muster.